Pacers Bikeshare and the Indianapolis Cultural Trail encourages everyone who will be downtown to #OptOutside and take advantage of a free, healthy activity and explore the Indianapolis Cultural Trail: A Legacy of Gene and Marilyn Glick on Friday, November 24. 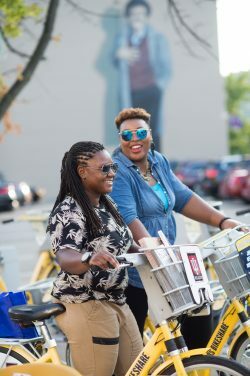 Individuals wanting take advantage of free access to Pacers Bikeshare on Friday, November 24, can do so by checking out a bike at any of the 29 bike share stations located on or near the Cultural Trail in downtown Indianapolis. A credit card must still be used when checking out a bike and usage fees for trips over 30 minutes still apply. Bikes can also be accessed through the BCYCLE mobile app available for Apple and Android devices. The mobile app provides real time availability for bikes and stations. More information about how to use Pacers Bikeshare is available at www.pacersbikeshare.org. Indiana Pacers Bikeshare, a program of Indianapolis Cultural Trail, Inc. launched on April 22, 2014. The 250 gold bicycles are available 24 hours a day, 365 days a year. Indianapolis Cultural Trail, Inc, a 501(c)3 organization, is a world class leader in urban trails and linear parks and is committed to a sustainable funding model that ensures accessible connections for future generations on the Indianapolis Cultural Trail: A Legacy of Gene & Marilyn Glick. About #OptOutside: The #OptOutside movement started three years when REI decided to close its stores on the day after Thanksgiving and encourage people, and their employees, to spend time outside with their friends and family.